Redboy/Vindicator dog from the Latin Connection. 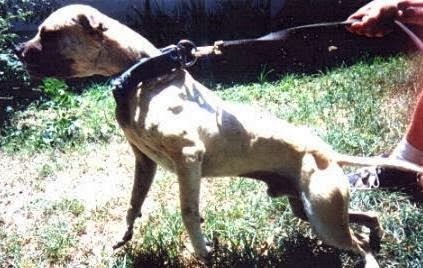 This dog had won some off the chain shows and was reputed to have stopped several dogs. Haunch again went uphill in this roll making the other dog quit in 14 minutes. We courtesy scratched Haunch and decided right there to hook him up for his first show. We got a call and hooked Haunch into Winchester and Tried and True Kennels’ dog named Able. The match was set for 61 pounds with the Gator Boys to ref. Haunch was the under dog being that we were a relatively unknown kennel and many good dogmen felt that Able would whip Haunch fast. We were told that Able was a rough game dog and Haunch would not stand a chance. Haunch’s keep went well as he is a hard worker. The day of the show we brought our dog and our money and were confident that Haunch would prevail. 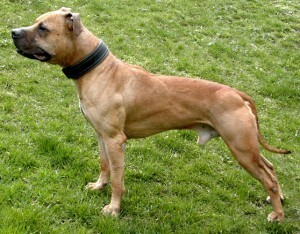 When they brought Able in, he was raging at the end of his leash and was built like a walking brick-house. Both dogs came in on weight and after being washed they were brought to the square. 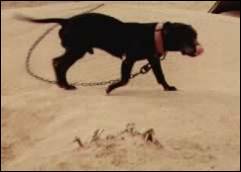 The Gator Boyz called out to release them and the Able dog came out like a greight train. He was trying to barnstorm Haunch by driving and shaking anything he could get a hold of. The other side was assured this would end fast and started calling out bets for high amounts of money. We took any bet we could get our hands on with the philosophy if you’re gonna lose you lose big or if you win you win BIG. They fought hard and fast with both doing damage where they could. Haunch fought defensively and was continuously trying to figure out Able’s style. Eventually, Haunch figured out how to control the fight with ear holds and started getting chest holds that frustrated and hurt Able. In the end, Haunch began to break him down and dismantle him. Slowly but surely Able started to show the tell tail signs of a down dog as Haunch punished his head. At 55 minutes, Able was called to scratch and he quit by stumbling to a neutral corner. Haunch gave a hard fast courtesy scratch for his first win. After this we hooked him into N.W.O. Kennels but 4 days out from the show we called to confirm the location and they forfeited. After this wasted keep we tried again to hook Haunch into anybody. Southern Kennels had put in their ad which listed under Mayday’s offspring that Haunch was open to the WORLD. Unfortunately, no calls came. Finally we hooked into Heavy Hitter’s and their 1x winner Chaos. This dog came from Raging Bulls yard. We set this match for 59 pounds with Sami the Arab to ref. Haunch always got carsick and on the way to the show he threw up bile and what little fluids he had in him causing him to come in light and dehydrated. We rested him as best we could and the show was on. In this match he outclassed Chaos in every way and soundly beat him in 46 minutes. There was an out of holds called and it was against Chaos. When he was to scratch, he refused by collapsing in his corner. We courtesy scratched Haunch and he flew across making him a 2x winner. For his Championship, Haunch was hooked into Gator Boys and Spank’em Down’s Rage. They figured that they had the dog to stop Haunch. We were hearing a lot of talk about how Haunch was going to meet his match and how Rage was gonn cur Haunch etc. We took it in stride and let Haunch do our talking for us. This match was set for 59 pounds with Sami the Arab to ref again. The night of the show the dogs came in on weight and after washing them, they were brought to the square and released. The two hit like a head on collision of two Mack trucks. Two big dogs, swapping and fighting fast and hard. Rage came out extremely strong and was barnstorming Haunch around the pit with Haunch systematically breaking Rage’s holds and getting in where he could. The Rage dog was fighting fast, trying to back Haunch into the corner but Haunch would not let that happen. 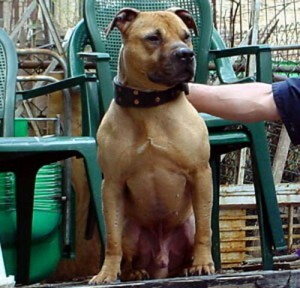 Haunch alternated from riding out ear holds to his trademark driving in on the dog grabbing chest/shoulders holds. At the 30 minute mark, Rage starts to fade and Haunch begins to take over the show. At 48 minutes, Rage was called to scratch and he collapses and takes the count. Haunch is screaming in his corner and when released for his courtesy scratch, he flew across, making him Ch Haunch. Ch Haunch. He said that his Bubba dog could whip Haunch (If I had a dollar for every time I’ve heard that one) and that we would not go into his dog because we had pups off Haunch and we were afraid he would quit etc. Our Partner and Knockout Kennels exchanged words back and forth. Anyway, Bubba won that night making him Ch Bubba. The next day our partner tells me and our other partner about how Knockout said this and that and his trash talk had really gotten my partner heated. We decided as a team that if we were to take Ch Haunch out again, it would be into a Champion or better. We felt that if this guy wanted to trash talk against our dog and if others in the game were questioning our dog’s credibility, then the only way to prove to them was by taking Ch Haunch out of retirement and letting them see who’s got the bulldog and who’s got the cur dog. We decided to hook into Knockouts Ch Bubba who was out of Camp’s Ch Luther and a daughter of STP’s Gr Ch Buck. We set this match up for 58 1/2 pounds. We wanted 59 he wanted 58 and we finally agreed on 58 1/2 with STP to ref. We knew this was going to be the biggest match of Ch Haunch’s career but we were confident as ever in him. We knew that Knockout Kennels and ourselves had a lot to lose. But in this game, there is only one way to be the best and that’s to BEAT THE BEST. Haunch’s keep went well and time came to decide on a spot. We knew that HAUNCH gets car sick but we decided to bite the bullet and travel a total of 2 1/2 hours. At this point we just wanted to get this show on and would have traveled across the country to beat this dog. On the night of the match, we arrived and weighed the dogs. Bubba comes in over the weight. We gave Knockout an opportunity to try to take the weight off his dog but he was unable to do it, so he paid the forfeit. We came to beat his dog not to run with his money so we took the forfeit and proceeded with the match. we brought Haunch in to weigh and he’s screaming and truying to wiggle his way out of my partner’s hand and was ready to destroy anything and everything on four legs. It seems being locked up in that crate for that drive did nothing but piss Haunch off to the point of rabidness. He knew what time it was and unbelievably did not get sick in the car. We brought the dogs to teh pit and STP called face your dogs and it was on. The two Champions hit hard in the middle and immediately began to swap hold for hold, shaking and fighting hard in an all out was. The fight was pretty much even as both dogs tried to ut power the other with Haunch driving and driving into Bubba. The two dogs were fighting hard and furious by taking ear, chest and shoulder holds. Bubba had the peculiar style of turning like the legendary Gr Ch Hank, then biting, shaking and scratching. A turn is called on Bubba and the dogs continue to fight until a handle can be made. Bubba scratches hard by running into Haunch who in turn grabs him and they both fight hard to be on top. We made a good handle and Haunch scratches straight and true. The two Champions alternate in shaking the hell out of each other but Haunch starts to really dig in deep and Ch Bubba starts to sing from the pain. After six more scratches and much more damage to each other, it’s Bubba’s turn to scratch at the 1:50 mark. This was the longest either dog had ever fought. Haunch has never went past the hour mark so he was deep into un-chartered waters. When released, Bubba turns his face away refusing to look at haunch and quits on all fours. We immediately asked STP for a courtesy scratch and Haunch makes his scratch hard and fast by slamming into Bubba. This showed everyone present that night (all highly respected dogmen) what a true Champion looks like. We quickly worked on our dog, collected our bets and put our 4x winning Champion in his crate and made our trip home. I think this was the best hunt of all for Haunch because of the huge amount of money that was riding on the match but also in terms of the way he performed. No matter how hard or ruff Ch Bubba tried to bring it to him, Haunch never let himself get behind. His number one priority while in the corner was to get back to that dog and end it. 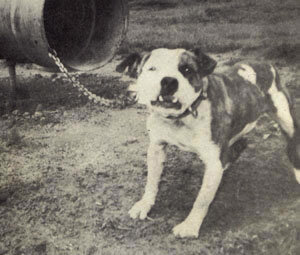 At nine years old, Haunch was hooked into Storm Trooper Kennels, with his 2x winner called Big Boy, a Mims dog. He was ducked and dodged by the best for his awful face and head style. The show went 1 hour 45 minutes and Ch Haunch was never in control, loosing an eye, and his muzzle crushed, he still tried to dig the chest and did some damage whenever he got in there. Big Boy’s camp would get nervous as they saw Haunch was still biting hard in the chest and hurting the dog. At an hour and 43, an out of holds count was give with Big Boy to go, he did not, Haunch was scraped off the ground, washed off with a sponge, walked steady over to Big Boy and took a hold, making him a Grand Champion. Beteran dogmen were there saying it will be a long time coming before you ever see that again. Haunch was a smart dog in the house, he would roam the house, not bothering any dogs in the kennels, and would be spoke to at times with his own language that only he and the owner knew. Haunch would stare at you and just plain flat out intimidate you. He was bred a few times. lots of his offspring ended up in pet homes, or in the wrong hands. Haunch was by far a better produce than he was given credit for, since about 90% of his kids never saw a tooth in them, but the one that did, man oh man. At this point I would like to say that Gr Ch Haunch 5xw, was always conditioned by using a natural keep and he never need the aid of steroids to defeat his opponents. Throughout his career, he has never turned or made a bad sign and none of his opponents have ever lost to him by scratching game, they either quit or were too destroyed to carry on. The info above is all hearsay and cant be confirmed by me or anyone I know, this is all from the net and I have no direct involvement with the dogs mentioned, I am just a fan and an armchair historian of the breed. This article should be treated as hearsay and has been fabricated solely for entertainment purposes only. 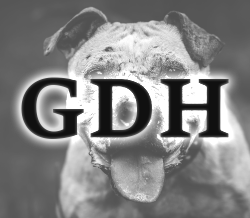 To my knowledge, Gr Ch Haunch has produced Ch Swuitchblade, Ch Doo, Lil Ham 1xw, Spaniard 2xw, Maximus 1xw 1xl dg, Mr Haunch 1xw, Holly Girl 1xw, Haunch Jr. 1xw, Crisis 1xl DG and a grandson named Ch Dee Man who beat the famous Ch Lil Rascal. 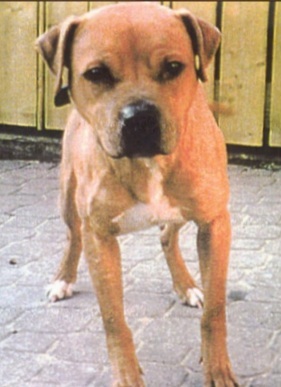 Note: Gr Ch Haunch also produced the very game 1xw known as Georgia Girl. She carries the tittle of having the longest match of modern times by going 4:40.